Institutional racism harms everyone it touches: even the privileged, from brilliant Thomas Jefferson to rather average me. It is a rot which eats away at our common humanity. I feel a lot of compassion for Ferguson, Missouri, police officer Darren Wilson. He could have been me. There are differences, of course. Darren Wilson is a big guy: 6’4,” built like a cornerback. I’m short, chubby, and harmless. I’m shy and retiring. He’s physically assertive. He couldn’t be a cop otherwise. I’m reflective, pondering big questions and large implications. Darren Wilson is not reflective. In his recent New Yorker interview, he studiously avoided implications and context of his police work, particularly his confrontation with unarmed black youth Michael Brown. But again–I don’t know if you can put on body armor and patrol each day if you do think too much about such things. Darren Wilson was conscientious at his job. He wanted to get ahead. I’m similar. As a police officer, Wilson chose to work first in Jennings, Missouri, then Ferguson, precisely because he believed patrolling difficult areas would further his career. We’re similar in other ways. He dotes on his new baby. I dote on my daughters. We both grew up blue collar. Maybe most important, we both grew up internalizing 400 years of cultural baggage that looks on African Americans as less human than Euro-Americans. Wilson is 29. I can’t say I saw racism much more clearly than him at that age. So I don’t see a monster or even a “bad cop.” I see an average cop, no better or worse than thousands of other police officers. That’s precisely the problem. Racism taints police work along with everything else. The police motto in many cities is, “To protect and serve.” As too often practiced in minority neighborhoods, it turns into “Occupy and control.” That was definitely the mode Wilson was in when he confronted Michael Brown. More than one police analyst has deemed Wilson’s aggressive approach “terrible police work.” Even so, it was in keeping with his training and Ferguson city policy. The Justice Department’s investigation revealed, those policies themselves were corrupt and deeply racist. Police were made into occupiers–and collection agents–for Ferguson city government. Fines against poor and African American citizens, were a key part of the town budget. Police who didn’t issue enough citations were subject to discipline. In Darren Wilson’s own words, he disliked “using minorities as a cash cow.” At the same time, he did–and still does–studiously avoid looking at the deeper implications of his own participation in such systemic racism. Make no mistake, he is suffering in the aftermath of killing Michael Brown. At the same time, he’s not suffering enough to look hard at what happened. Which doesn’t make him that much different from the rest of “white” America. Racism and racist institutions are blatantly evident. Look at income rates, incarceration rates, arrest rates–dozens of statistical fields. Take a Harvard University implicit-association test to quantify your own prejudice. But because of our discomfort looking at such things, institutional racism becomes effectively invisible even while it does its pernicious work on us. 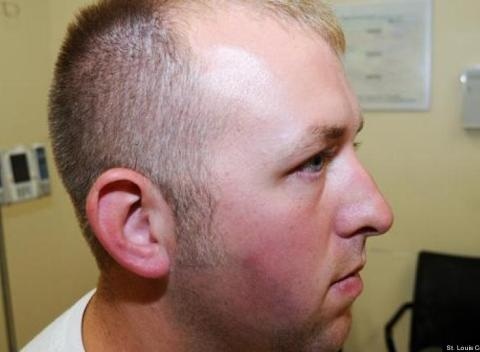 Meanwhile–Darren Wilson is not unscathed. Official inquiry may exonerate him. Conservative America may uphold him. Other police departments may stand behind him to the point of holding special “days” in his honor or sending postcards and badges as support. But he doesn’t have a job, does he? I don’t think he’s a “bad apple” any more than the rest of us: any more than I was at age 29. But he’s not employable, either. The Ferguson Police Department and others have termed him, “a liability.” They support him with words but “throw him under the bus” with actions. He’s a marked man with no more chance of employment than would a real “bad apple” who got caught. Maybe even less. Then again, he’s alive. Michael Brown is dead. That’s the difference–the way the system works–the difference between privileged victims of racism and oppressed victims of racism. I participate in the Black Lives Matter movement–not because I’m better or smarter than Darren Wilson. I participate because Darren Wilson at age 29 could be me at age 29. Because racism harms every person it touches, including me. Because it’s crucial to put spray-paint on invisible racism and make it visible. Crucially, we must serve notice that institutional racism can, in fact, blow up even in the face of those it privileges. That’s our job: to use civil action to reduce profits for municipalities and institutions that do profit from racism even while denying it exists. It’s not just Ferguson. Racism corrupts police work in too many places. Too many honest officers get turned into enforcers for corrupt systems and into collection agents for corrupt municipalities. Then when it does blow up, it blows up on them, too. It crushes the spirits of those on the receiving end. A young black person winds up dead. But honest police are at risk, as well. It’s to everyone’s advantage to name this infection and work to lance it. I could have been Darren Wilson. I participate in the Black Lives Matter movement–because all who are touched, are impacted. That includes you and me. The American soul has been in hock to the worst forces in human nature for 400 years. To work for redemption is to save–and be saved. If justice triumphs in the end, there will be no distinguishing between the the redeemers and the redeemed.